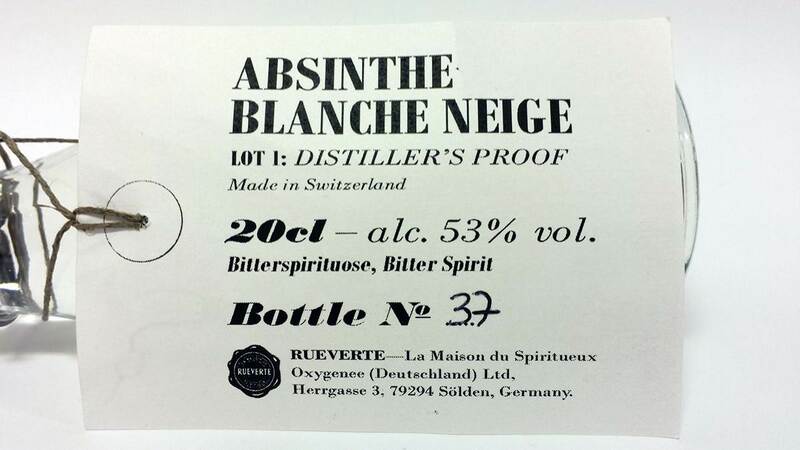 Absinthe Blanche Neige is a Swiss La Bleue, distilled for Absinthes.com. Packed with alpine freshness and a fruity minty punch of wormwood to knock you right out of your boots. The Blanche Neige is a... well... blanche. 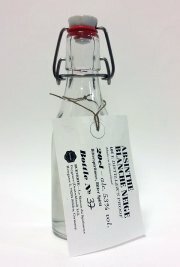 It's sold through Absinthes.com and distilled by the little distilery of Gaudentia Persoz (makers of La Ptit). This is the distillers proof and according to Absinthes.com the first, after six trials and some tweaking, to reach the public. It comes in a small clear glass bottle with a patent cork, which is super convenient. It doesn't brake, it's easy to open and it looks nice. Attached to the neck and cork mechanism is the label in the style of a postal bag tag, like on the Blanche Traditionelle Brut d'Alambic. The packaging is simple but that is not something you can say about the absinthe itself. Sure, it's a Swiss Bleue deep down but I must say it has a way more interesting profile than most standard La Bleues. It's simply more interesting. The first thing that immediately strikes me when pouring a measure in my glass is the pronounced wormwood and fennel. It's absolutely wonderful. Minty, fruity and with a very fine lingering alpine freshness that stays forever. The aroma is very nicely balanced even though the wormwood and fennel, and also anise, stand out quite much. It never gets too much. Upon adding iced water it produces a steady, thick and very inviting louche. It's not the milky thick creamy white louche you get in many star anise/fennel bombs from typical Val-de-Travera blanches but rather the refined more sophisticated louche I so much like about the Duplais Blanche. Water opens up the aroma even more and let more of the alpine perfumes make their way through the steady stream of the wormwood scent. A hint of what I would think is pontica and a touch of what could be the genepi that is supposed to be in the Blanche Neige mix together nicely and all together it is easily like being asked out on a date with a spring fresh swiss alps fair maiden. So, finally kissing this maiden... The Blanche Neige has a wonderful mouth feel. Very crisp and rich. Leaves a nice minty touch and a lingering floral bitterness, not dry mind you, and as soon as that sip is swallowed - you want more. In other words, this is a mighty nice blanche. Is there nothing bad about it at all? That depends... I tend to think many of the Swiss Val-de-Travers style blanches become numbing and dull after a while. The Blanche Neige doesn't quite fall in there but in the back is this same character, it's just held back. I really like it but I can see myself not wanting to drink more than two glasses in one night. As with most "Bleues". Summary then - the Blanche Neige is a very very nice variation of a traditional Val-de-Travers blanche. It's a small step outside the regular box which makes it more interesting and "fun". It's definitely well made and the ingredients are of good quality. It's a good absinthe, no question about it. And it's not just another copy of the old fair of La Bleues. It has more going on.